In January I made the best decision that I could make under the circumstances and that was to retire. After being fired from my job in December and looking at the employment situation for those over 50 years of age I decided that this was the best course of action. Do I regret this decision? In short – No! Since my retirement I have assumed the duties as treasurer of my Masonic lodge, and have been asked to be the treasurer of three other related bodies associated with the lodge. This has been a real challenge since it has been more that 25 years when I took accounting classes. But with the help of a computer program I am remembering some of the basics from those long ago classes. I have taken on the duty of mentor/coach from one of our new members helping him to learn the parts of the ritual he needs to proceed to the next degree. This has been a blessing in disguise for it has helped me learn and practice patience, not only for him as he learns his ritual but also for my life at home. I may be learning and practicing, but I do not always succeed in this endeavor. Physical fitness has again become a large part of my life. It sometimes it must be put on hold due to many health concerns that have developed with my wife and me. I like to ride my bike and have taken short to moderate rides in the area. Some rides were as short as 10 miles to as long as 40. 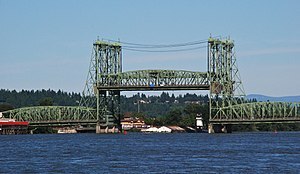 Today I rode west along the Columbia River in Oregon crossed over the I-5 Interstate Bridge to Washington and road east to cross the I-205 Glenn Jackson Bridge back to Oregon. It was a pleasant journey and I was home in time to shower and accompany my wife to our Weight Watchers meeting. When the weather is not being cooperative I have an athletic club I can go to and get a workout. Speaking of my wife it has been a pleasure for me to reacquaint with her. Her presence has brought me joy and we have been able to rekindle those passions within us. Not that our passions had been smothered, but with working, activities outside the home, and other everyday situations we were not taking the time to appreciate each other, now we can and do. I feel that I am very lucky to have married her and that our relationship has survived. When we look around us and see so many that have not. This has freed me to spend time with my daughter and friends. My daughter now feels the freedom to call and ask for help when she needs it. We have become closer now that my time is no longer spent at an office. Recently the son and daughter-in-law of a very close friend had their first child. My friend has a small dog and they were going to just leave him in the car while they were in the hospital. I convinced them to leave Johnny with us; he would be much safer here. Besides Johnny and my dog Scamp get along very well, they play and love to lie in our laps. Despite the tension of the workplace which I am now freed from, I have found the happiness after their action in December. If it were not for my medical condition that precipitated the action taken I would not be having more time with my wife and doing the activities I enjoy. Previous Article Am I In or Out?